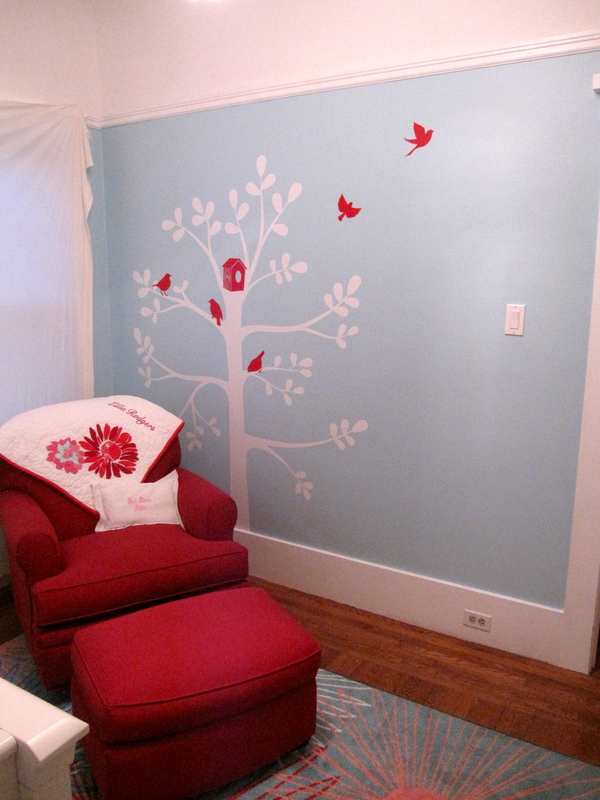 Tree decal and glider in Lilla's nursery. Welcome to Lilla’s 21st century baby book. Today, July 5th, 2011, is her official due date. Yet there are no signs of her arrival. I’m convinced she’s aiming to be fashionably late. For my body and my sanity’s sake, I just hope she’s not too fashionable. Since this is the first official post, I’ll go ahead and give you the Cliff notes version of my pregnancy over the last 10 months. Don’t worry, I won’t get too graphic. Nausea throughout month 2 and 3. Though there were some mad dashes to the restroom at work, I thankfully never got sick. Jon bore the brunt of my finicky appetite – Captain Crunch with Crunch Berries, ice cream, fruit and an aversion to vegetables and steak. In the weight department, I hadn’t gained enough to warrant maternity clothes, though I did have the pleasure of sporting a perpetual muffin top. Once the nausea subsided and I actually started showing, I really enjoyed the second trimester. Jon and I found out we’d be having a girl and were able to clearly see her little hands, feet, head and belly on the ultrasound. The only thing cooler was the first time I felt her kick. Talk about surreal. And after buying my first pair of maternity jeans, I came to the conclusion that every pair of pants should have an elastic waistband. Holy comfortable. Months 7, 8 and half of 9 were actually pretty similar to the previous trimester. I still felt pretty good, though sleeping became a little tougher. It wasn’t until these last few weeks that my ever-growing belly required frequent middle-of-the-night bathroom trips and produced some seriously heinous cankles. Something Jon and I still laugh about. My belly is filled to maximum capacity. Yet Lilla doesn’t seem to mind. She moves a ton, to the point where you can see a foot or hand poking or stretching. Even though it’s getting more uncomfortable for me, it’s still really awesome to see and feel her moving around in there. Jon and I are very anxious to finally meet our little one. We’ll keep you all posted on when that will be. We’re praying it’s soon. Oh Kell…thanks for this blog. I have to laugh at your descriptions, etc. We are hoping Lilla gets out of there soon for your sake. Can’t wait to read the post when she’s born!!!! Sending much love and hugs your way! Post lots of pics when she finally decides to arrive! What a cute idea. Thanks for the update. I hope you are feeling great. Keep me posted on any changes. Grandma and Grandpa Rodgers can hardly wait for Lilla to make her grand entrance into the world! Kelly…thanks so much for setting up this blog. You can bet I’ll be checking it often for stories, pictures, and any little tid-bit regarding the newest member of the family. Come on, Lilla, your fans await!